Lake Tashmoo, Lagoon Pond and Menemsha Pond are the most dire, according to a report by the Martha's Vineyard Commission. The Martha’s Vineyard Commission presented a new water quality management policy with a heavy emphasis on the Island’s high nitrogen concentrations in coastal ponds at their meeting Thursday evening. 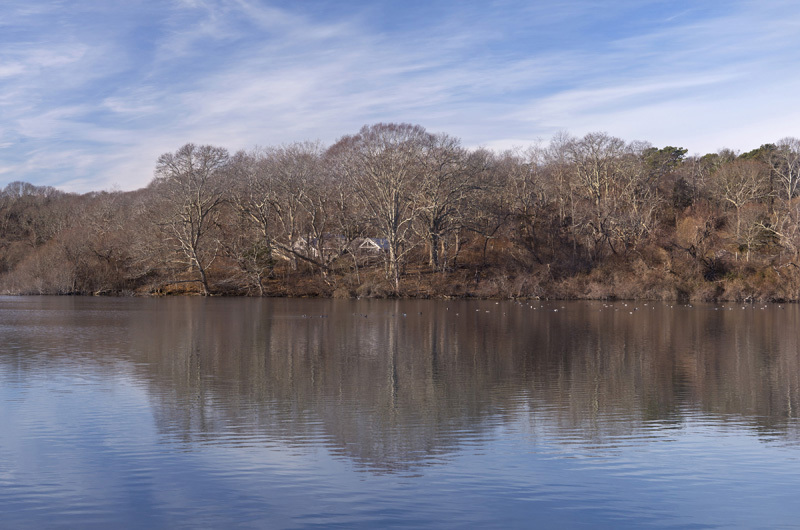 The current policy has been in place since 2006 when very few Massachusetts Estuary Project (MEP) reports were available that gauged the health of Vineyard ponds. Due to the growing research indicating the threat of nitrogen loading in the ponds, the commission’s DRI water quality committee worked over the past year to update and revise the policy. Twelve of the 15 coastal ponds and watersheds with water quality data collected by the MEP and Buzzards Bay studies are in urgent need of nitrogen reduction, according to the committee. Lake Tashmoo, Lagoon Pond and Menemsha Pond are the most dire, with all requiring a more-than 30 per cent reduction in nitrogen per kilogram per acre per year. The committee writes in its 33-page policy that its objective is to keep the overall nitrogen loading in each pond below the critical threshold drawn by the MEP to ensure sustainability of the ecosystem for recreational and commercial use. Strategies outlined by the committee focus on limiting nitrogen use in fertilizers and utilizing available technology to treat wastewater effluent. MVC executive director Adam Turner stressed that this is only a two-year policy and will be reviewed after that time as changes to nitrogen mitigation technology occur. The policy will be discussed in detail by the commissioners at the next meeting before moving to a public hearing. 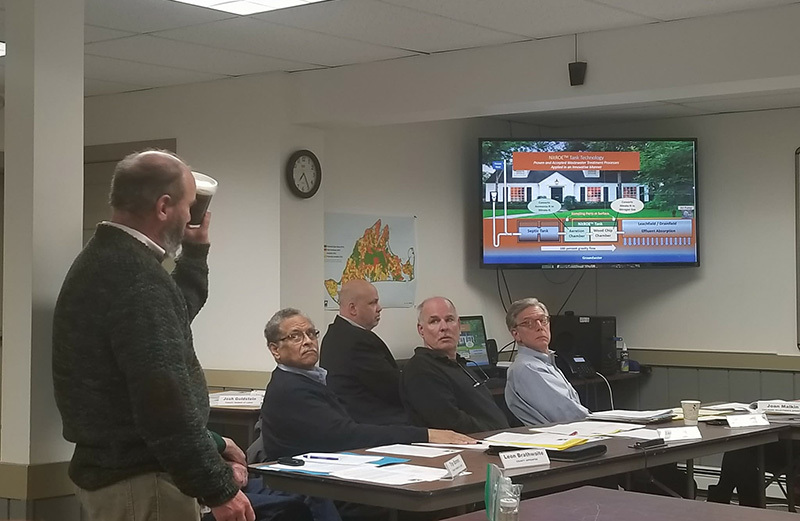 One of the technological innovations that the commission is reviewing is a sustainable wastewater treatment tank system developed by CES Clean Water in Edgartown. John Smith, a partner at CES, explained how the tank works and presented his preliminary findings on its effectiveness from the first tanks installed on the Island in December. According to Mr. Smith, there are two versions of the tank, NitROE and SanTOE. NitROE tanks are built for use as a supplement to existing home septic systems while SanTOE tanks would be a new system used to treat large loads of municipal and industrial wastewater. The NitROE system is a separate 1,500-gallon tank with two chambers that is installed between an existing Title V septic system and leach field. One chamber is aerated while the other is filled with wood chips, mostly oak, said Mr. Smith. Mr. Smith explained that when the gravity flow of effluent moves through the first chamber, organic nitrogen and ammonia is converted to nitrate. The wood chips in the second chamber then cause the nitrate to become odorless nitrogen gas that is safely released into the atmosphere. “The estimate for total nitrogen reduction is about 95 per cent,” he said. The first NitROE system was installed in Tisbury last December for a six-bedroom home. CES plans to install 10 more tanks in Tisbury this June for a pilot program, three within the Lagoon Pond watershed and seven within the Lake Tashmoo watershed. The program is funded by a $150,000 grant from the Massachusetts Clean Energy Center. Michael Murphy, director of water innovation at the center, was also present at the meeting. He said that 1,000 NitROE tanks installed in Tisbury would be able to remove the 11,000 pounds of nitrogen annually required to bring ponds down to the MEP levels for sustainability. Mr. Murphy said homes would typically require two 1,500-gallon tanks, ranging from $10,000 to $13,000 in cost. The SanTOE system uses a similar process, but the water moves through three beds that can handle an influx of 500 to 1,100 gallons of daily flow, according to Mr. Smith. A SanTOE unit was installed at the Massachusetts Alternative Septic System Test Center last December and showed the same 95 per cent reduction after a 24-hour composite sampling as the NitTROE system. Mr. Smith said the next steps for his team are to install NitROE and SanTOE systems on Cape Cod and the Vineyard under a pilot permit program to demonstrate that the system technology is an affordable and sustainable option for reducing nitrogen loads. “We will guarantee a performance we know we can meet,” he said. A couple Points - first and foremost the towns need to start with inspections, repairs and replacement with home and businesses within 500-1000 feet of the ponds rather than try to enforce new regulations on entire watersheds. 2) Systems must be approved by DEP prior to establishing rules - which as I heard - they are not -therefore leaving homeowners with a regulatory nightmare and expense. 3) is that 10-13k per tank or a total expense? 4) no where do you say who gets to shovel Oak chips saturated with sewage and how often that will need to be done? If these systems will actually remove 95% of the nitrates , I am all for it but lets get all the information and approvals in line first.